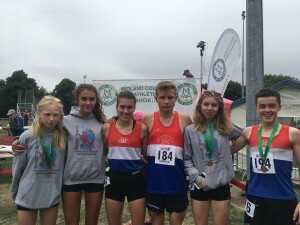 6 of our junior athletes competed against the very best athletes from across the midlands at the Midlands Track & Field Championships held at Nuneaton on Saturday 11/8/2018. 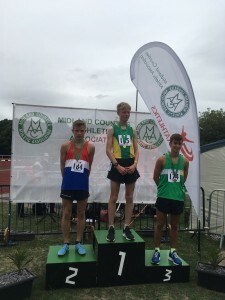 In the U/15 Boys 1500m we had Louis Wakefield, looking to add to the Midlands Bronze he won earlier in the year on the road over 5km. Louis ran strongly once more and finished in 3rd position in a time of 4:52.97 to gain his first Area Track medal. 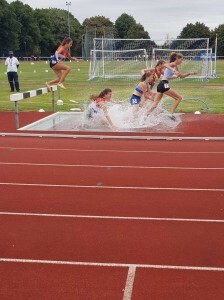 In the U/17 Women’s 1500m Steeplechase we had two competitors, with Scarlett Cotton and Nadine Tomkinson both competing in the event they took up earlier this summer. 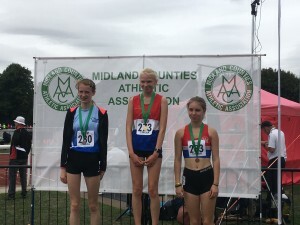 Both recorded PB’s but just missed out on a medal despite only being in the first year in this age group, with Nadine finishing 4th in 5:57.97 and Scarlett in 5th in 6:05.74. Well done Nadine and Scarlett, great experience for the future. In the U/17 Women 3000m again we had two competitors, Lizzie Clarkson and Misha Twardochleb. After a conservative start where the competitors ran together it was Lizzie who made the break with 4 laps to go. Lizzie pulled away to win in a time of 11:20.51 and Misha ran strongly to finish in 3rd in 11:39.70. Both Lizzie (by 10 Seconds) and Misha (by over 60 seconds) ran new PB’s and claimed their first Area medals. Well done Lizzie and Misha and good luck for next year in the U/20’s Lizzie and once more as an U/17 Misha. 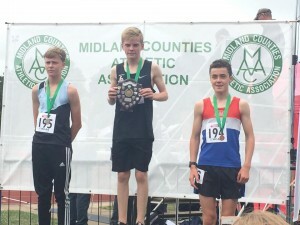 In the U/17 Mens 1500m Lewis Nagington was our sole competitor. Looking to add to his road 5km Bronze from last year and competing against one of the strongest fields of the championships Lewis was not one of the quickest on previous times but once more showed what a great racer he is becoming. Running a strong tactical race, which increased in pace every lap, saw him take on the field with 400m to go he was rewarded with 2nd position and a time of 4:23.46. Well done Lewis. Congratulations to all 6 of our juniors, some great performances. To gain 4 medals (1 Gold, 1 Silver and 2 Bronze) at midlands level is a great achievement for our club and thank you and congratulations to, to our Juniors Coaching team who have guided our athletes so well once again this season.